Pitch Deadline EXTENDED to September 30! 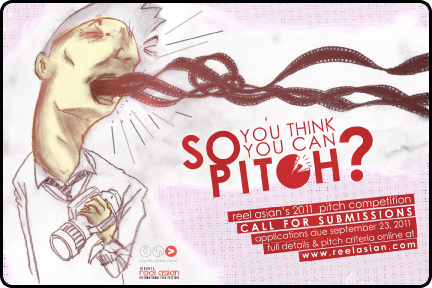 Bring forth your best film ideas at the 2011 Reel Asian and CSV pitch competition, $1500 in cash plus production services for the winner in each category! Bring forth your best film ideas at the 6th Annual Toronto Reel Asian and Charles Street Video pitch competition – So You Think You Can Pitch? ! The 2011 Toronto Reel Asian International Film Festival is looking for submissions of short films ideas. Once again this year, two winning filmmaking teams will walk away with amazing prize packages that will help them kick-start and/or finish their short film. The two prize packages include $2000 in cash, of over $10,000* for the Emerging Category and $18,000* for the Established Category in production and post services, and a one-year membership at Charles Street Video (CSV), and a distribution option through Ouat Media. Selected finalists teams will participate in an intensive boot camp at the Reel Asian Pitch Clinic, where finalists gain in-depth professional advice on pitching like a pro in front of a live audience. Finalists will compete at a live Pitch Competition Finale during the 2011 Reel Asian Festival this November 8-13th. Finalists will also be awarded with a 2011 Festival Pass, with access to festival screenings and Industry Series sessions, where you can gain insightful knowledge from industry professionals and access the many networking opportunities throughout the festival. We are open to all your great films ideas, be it dramatic, documentary, musical or experimental, up to 30 minutes in length, as long as you feature an Asian member in a key creative role, either in front or behind the camera. Selected by a panel of three judges, five teams of finalists in each category will advance to the Pitch Competition Finale to take place during the 15th annual Reel Asian International Film Festival, November 8th to 13th, 2011. Finalists will be coached by an industry professional to fine-tune, receive feedback and support in developing their pitches for the judges and a live audience during the festival. Attendance at the clinic is mandatory. Exact date and time to be confirmed. **All pitching teams must be present at this event.